Formulation Support - AMSA, Inc.
Let AMSA help you bring the surface cleaning and organic deposit penetration and dispersion power of DTEA II™ to your one-drum corrosion and scale inhibition water treatment chemicals program. 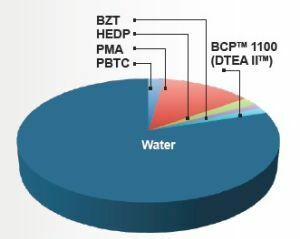 The following examples illustrate the ability to formulate DTEA II™ (BCP™ 1100) with traditional scale and corrosion inhibitors. Key to successful formulation of DTEA II with typical scale and corrosion inhibitors is low pH (less than 2). Examples of stable formulations containing scale and corrosion inhibitors and DTEA II (high and low concentrations of DTEA II and BZT). Examples of an azole-free formulation which utilizes the copper corrosion inhibition ability of DTEA II. Formulas designed for treatment of waters of two different scaling index. Suggested dosage 100 ppm. Components listed in order of addition. Contact AMSA, Inc. for more information regarding our formulation support.